26/12/14 -- EU grains finished the holiday shortened week generally higher than they began it, helped by news of an impending Russian export duty on wheat. Jan 15 London wheat was up GBP1.70/tonne on Monday, a further pound higher on Tuesday and gained another 35 pence on Wednesday, for a GBP3.05/tonne advancement on the week. 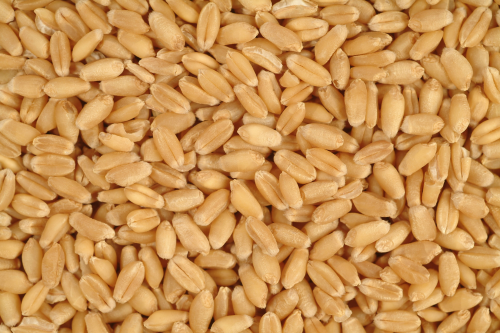 Paris wheat rose EUR2.50/tonne, EUR1.75/tonne and EUR0.75/tonne respectively, for a three day gain of five euro's. 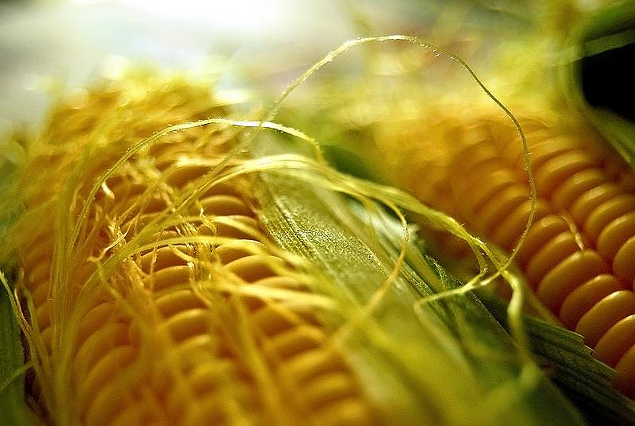 Corn was up EUR2.50/tonne on Monday, down a euro on Tuesday and up a further EUR3.50/tonne on Wednesday, for a net gain of also five euro's. Rapeseed was up EUR1.25/tonne, EUR1.50/tonne and another EUR1.50/tonne respectively, for a weekly gain of EUR4.25/tonne. The Russians announced that they were going to introduce export duties on wheats on Monday, with the details due to be unveiled on Tuesday, although this never happened. 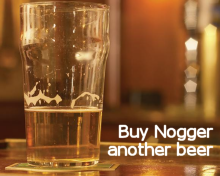 By the time I was waking from my festive slumbers on Boxing Day morning however, the inbox was full of emails saying that the duty will be for 15% of the custom cost, plus EUR7.50/tonne, and with a minimum value of EUR35/tonne. I assume that by "custom cost" they mean the net value of the cargo. So there we have it, a duty of at least EUR35/tonne on every Russian wheat shipment, commencing Feb 1, 2015. It's in the hands of the Russian government how much they are prepared to let through between now and when that particular window gets slammed shut. The Russian deputy PM has already thrown in the rider that "additional administrative measures" will be used to prevent excessive grain exports, presumably with specific reference to the period between now and the end of January. How Russian exporters, especially the smaller ones, are going to fund this minimum EUR35/tonne levy is unclear. The introduction of an export tax isn't grounds for claiming force majuere, and EUR35/tonne is much larger than the average margin that these guys will be working for. Meanwhile, Russian intervention purchases Tuesday and Wednesday have hardly been met with a flood of offers, with the government picking up less than 20 TMT across the two days, despite increasing the price that they are prepared to pay. 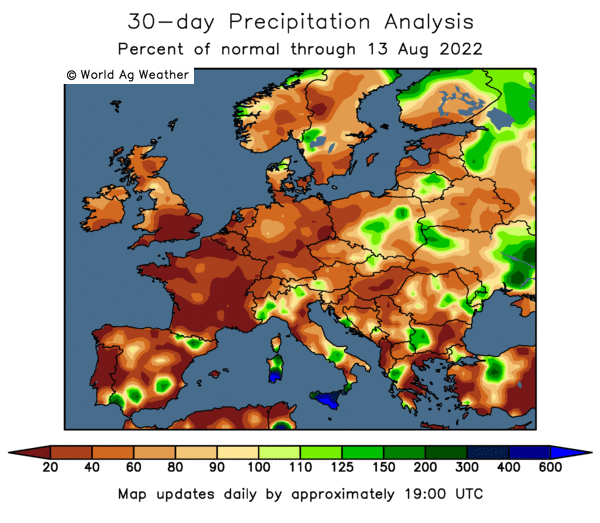 In other news, 40% of winter grains in the Volgograd region of Russia are said to be a cause for concern, following a lack of moisture in the autumn, and a subsequent lack of a protective snow covering. Across the border in Ukraine (there IS still a border there isn't there? ), 4% of winter grains haven't yet emerged, and 19% of what has are now said to be in weak/thinned condition. That's up 3 points on earlier in the week and compared to only 4% this time a year ago. In an Iraqi hard wheat tender, Romanian origin was said to be the cheapest offer at around £313/tonne, followed by Ukraine wheat at $323, Australian at $326, Canadian at $332 and US at $334 - Russian wheat wasn't offered at all. 22/12/14 -- EU grains opened lower, but turned around to trade mostly higher mid-morning following a Russian announcement that they are to rush through issuing "temporary" export duties with more or less immediate effect. At the close Jan 15 London wheat was up GBP1.70/tonne at GBP134.00/tonne, Jan 15 Paris wheat had jumped EUR2.50/tonne to EUR198.50/tonne, Jan 15 Paris corn was up EUR2.50/tonne at EUR159.00/tonne, whilst Feb 15 Paris rapeseed was EUR1.25/tonne higher at EUR350.50/tonne - the first close above EUR350/tonne on a front month since June. The Russian Deputy PM announced that the government were to rush through a draft proposal to introduce export duties today, and that these could be in place as early as tomorrow. He went on to say that of the 28 MMT of grains that Russia are expected to export this season, 21 MMT, or 75%, had already been shipped. The Russian Ag Ministry don't seem to entirely agree with him as they said that the country had exported less than 20 MMT of grains so far this season, including 15.5 MMT of wheat, almost 3 MMT of barley and nearly 1 MMT of corn (to Dec 17). The other main news of the day was Egypt's GASC buying 300 TMT of wheat for Jan 21-31 shipment over the weekend. Of that total 240 TMT was French, with Russian wheat also getting one 60 TMT cargo, thanks to a cheaper freight rate. Overall the prices paid were around $9/tonne more expensive than their last January purchase. They've now bought 655 TMT of wheat this month, compared to only 355 TMT in November. This latest purchase was said to be their largest single buy of French wheat in 3 years. 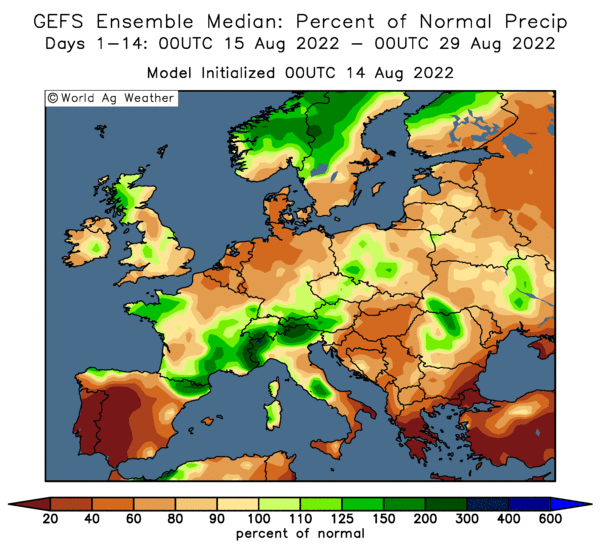 All in all this looks friendly for EU wheat. OK, Russian wheat was in the line-up, but only one cargo was booked (and offered), and that was only due to a freight advantage of at least $2.50/tonne. French wheat was the cheapest origin otherwise. US wheat was priced out by the best part of $30/tonne, and that was before adding on the much more expensive shipping costs. 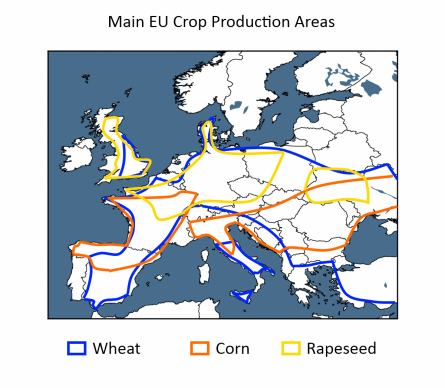 Today's Russian news should continue to ensure that EU wheat picks up further export business into North Africa and beyond in the weeks and months ahead. And meanwhile GASC are buying more as the price goes up, not less. Other than that, fresh news was relatively thin, as you might expect only a few days before Christmas. The Ukraine Hydrometeorlogical Centre said that winter grains there could be disadvantaged by the unusually mild December that they have seen, if and when a hard freeze returns. They said that 40% of the country's winter grains are rated in "good" condition, with 44% "satisfactory" and 16% "weak/thinned". The latter category has seen a 2 point improvement from earlier in the month, but having said that it is still high compared to only 4% this time last year. 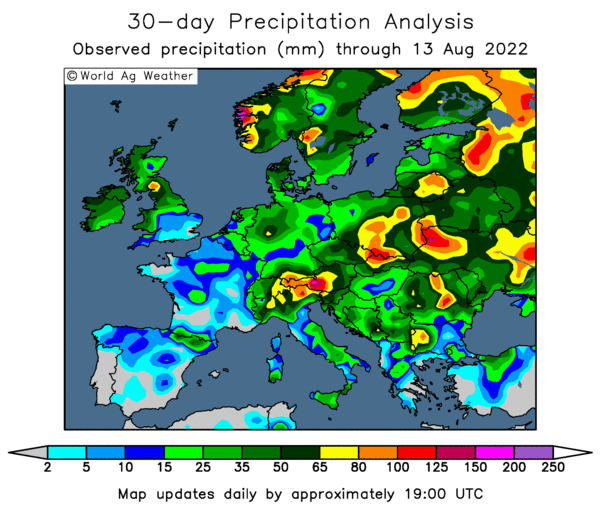 The USDA's FAS in Bulgaria said that wet weather had cut winter wheat plantings there by around 150-200k ha from what was expected. They estimated the country's 2015 wheat harvest at 4.6 MMT, down 6.5% on last year. The German Stats Office said that the country's growers had increased winter wheat plantings by 2.8% to 3.25 million ha. 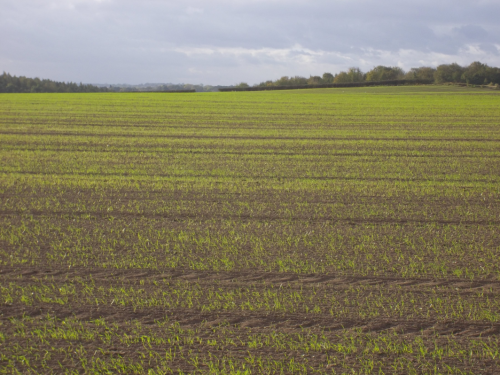 Barley plantings are up 3.3% to 1.23 million ha, and OSR sowings have declined 6.1% to 1.31 million ha, they added.